Big Apple meets Dickes B: From New York to Berlin …. Just for the weekend! 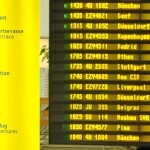 Berlins very new Airport BER: Berlin Brandenburg International is not finished yet. But some Airlines already offer new intercontinental flight connections. Berlin’s biggest player Air Berlin is offering now its new connections to New York, Verona and Oliba. And Royal Jordanian flys you down to the Middle East or even to South-East Asia. If you come from Barcelona and you are sick of local clubs and you wanna visit the Panorama/Berghain, then not only EasyJet and RyanAir could be your sole choice.. no – as from now you can also fly in with SpanAir. Ok unfortunately this will not help you to bypass the door at the Berghain Club. But it will connect two of Europe’s major party citys. Since Air Berlin is a low cost carrier, you get quite cheap deals for you Berlin flights. Why not fly in from Big Apple on a Friday for a weekend?! Yes you are in Berlin, 3,978 miles from home, don’t know what you done in the last 48h. But luckily you found a flight ticket under your pillow. It says that you have 2 hours to get back to the airport and finally back to your so loved Big Apple. This entry was posted in Party, Whats up in Berlin and tagged 2011, Air Berlin, Alexanderplatz, Backpacker, BBI, club, for free, Friedrichshain, Kultur, music, New York, Party, Whats up in Berlin by U inn Berlin Hostel. Bookmark the permalink.